Question: What is an Alpaca? 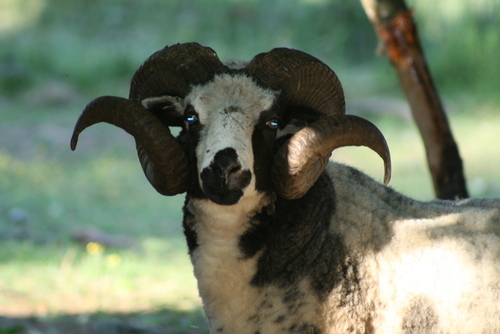 Answer: A gentle member of the camelid family, cousin to the llama, the alpaca is a livestock owners dream. Easy grazers, alpacas are earth friendly, as they do not pull up the orchard grass they prefer nor do their padded feet divot the ground. 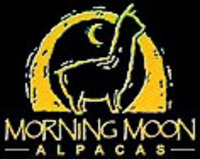 Extremely social, alpacas are herd animals requiring a pasture to graze on and at least a three-sided shelter to protect them from the harsh elements. Less than a cup of grain per animal and a free-choice mineral supplement rounds out their diet. 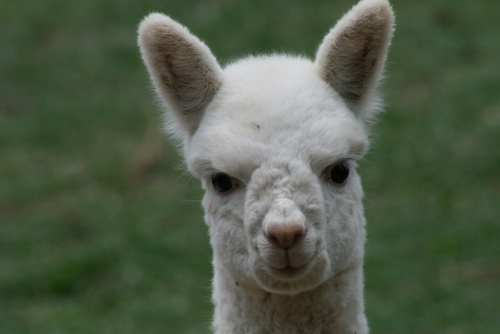 Originating in the Andes, the alpaca is a hardy animal requiring only simple husbandry tasks. Question: What is the difference between an alpaca and a llama? Answer: A llama was bred to be a beast of burden. A llama can carry 75 to 100 pounds in a pack on its back for long distances. It is bigger than an alpaca. Some llamas are 7 feet tall and weigh 600 plus pounds, where an alpaca is typically 5 feet tall and weighs less than 200 pounds. When viewing both animals from afar, the llama can be identified by its banana shaped ears that curve in at the tips toward the center of the head. 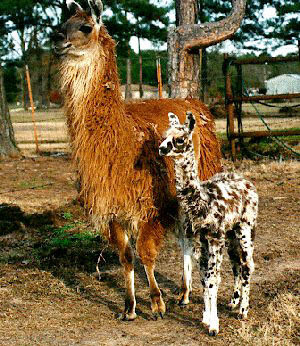 The alpaca was bred for its fiber and 80% of its body is covered with what is known as "prime" fleece (very nice). Even though the llama's fiber can be as warm as an alpaca's, it usually contains a courser hair know as a guard hair. The guard hairs can make llama fiber uncomfortable to wear next to the skin. Question: What is a Guardian Dog? Answer: One of the earliest uses for the domestication of dogs was that of livestock guardian possibly as many as nine thousand years ago. The Great Pyrenees is still used in their traditional role as guardian. What sets this breed apart from other livestock dogs is twofold. Firstly, The Great Pyrenees is not a herding dog. 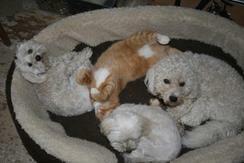 This dog has innate guardian tendencies that can be used for the home or for livestock. Not a breed to own for its capability to perform tricks, this is a working breed and is happiest doing so. 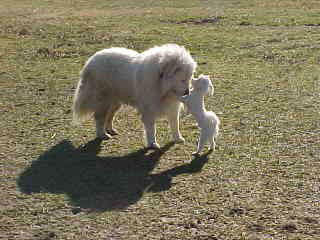 Secondly, The Great Pyrenees is known for its gentle temperament with children and its 'people' family, when socialized. Extremely intelligent and deeply devoted to that which they are in charge of, Pyrs are affectionate, loveable dogs. There are many other guardian dogs found arround the world to choose from. Our original dogs, Yankee Doodle Dandy, born on the forth of July, and Clover, who came to us on St. Patrick's Day, keep company with our alpacas. Their desirable guardian traits and their sweet disposition add an irreplaceable dimension to our farm and our family. To own a Great Pyrenees is to fall in love with one! Come visit us and see for yourself, they are truly irresistible! If you have more questions, please go to the Contact Us tab and we will try to get them answered.